You are currently browsing articles tagged Faith Comes by Hearing. Our Summer Newsletter has been Uploaded! Illiteracy is a huge hindrance to the study of the Bible, but it’s one that we believe can be overcome. Hit the link here or click on the picture to find out how a new partnership is providing us with a tool to do just that. While you’re there, don’t miss the rest of our latest quarterly update from the field! 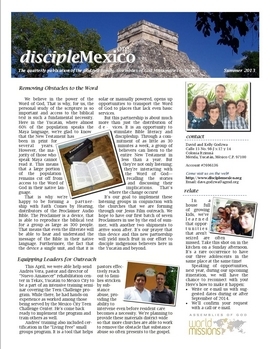 Our online newsletter is viewable as a PDF document. If you do not have the Adobe Acrobat Reader software installed, you may download it here. We believe in the power of the Word of God, that’s why a large part of our ministry is dedicated to preaching and teaching the Bible. Still preaching and teaching, at best, serve only as a gateway for personal exploration and application of the biblical text. It is a jumping off point for believers, encouraging them to dig deeper into what God would want to speak into their lives on any given subject. That is why personal study of the scripture is so important, and why access to the biblical text is such a fundamental necessity for any culture. Here in the Yucatán, where almost 60% of the population speaks the Maya language, we’re glad to know that the New Testament has been in print for several years and is widely available. However, when the majority of those who speak Maya cannot read the language, the benefit of this printed biblical text is severely limited, and a large portion of the population remains cut off from access to the Word of God in their native language. That is why we’re happy to be forming a partnership with Faith Comes by Hearing (FCBH), distributors of the Proclaimer Audio Bible. 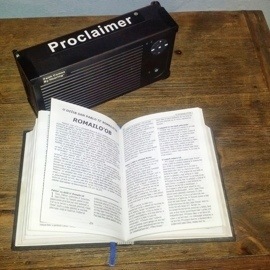 The Proclaimer is a device, approximately the size of a large radio, that is able to reproduce the biblical text for a group as large as 300 people. That means that even the illiterate will be able to hear and understand the message of the Bible in their native language. Furthermore, the fact that the device a single unit, and that it is solar or manually powered, opens up opportunities to transport the Word of God to places that lack even basic services. But this partnership is about much more than just the distribution of devices. Just this week, I was able to speak with Gil Moreno, one of the FCBH ministry staff, who took me through their philosophy of setting up listening groups in order to facilitate Bible literacy and discipleship. Through a commitment of as little as 30 minutes a week, a group of believers can listen to the entire New Testament in less than a year. But they’re not only listening; in these groups, they’re interacting with the Word of God, recalling the stories, expressing their feelings, and applying the truths. That’s where the change occurs! It’s our goal to implement these listening groups in conjunction with the churches that we are forming through our Jesus Film outreach. This way, even if a pastor is unable to visit a village for an extended period of time, discipleship is still taking place as new believers gather to hear and discuss the Bible. We hope to have our first batch of seven Proclaimers in use by the end of summer, with another two shipments to arrive soon after. It’s our prayer that this device and this new partnership will yield much fruit in our effort to disciple indigenous believers here in the Yucatán and beyond.